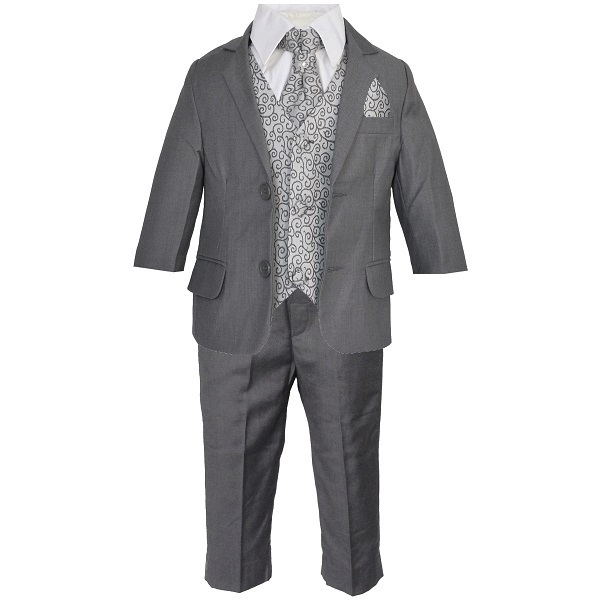 Grey swirl 6 piece slim fit jacket suit for baby boys, toddler or older boy, the perfect outfit for any special occasion including a christening, wedding as a pageboy / guest, formal occasion etc. Jacket: Fully lined grey slim fit jacket, double pockets on front with single breast pocket, two centre buttons with buttons on cuffs. Waistcoat: Grey swirl pattern, fully lined, double pockets, 3 clear centre buttons, plain back, adjustable strap/buckle on back for perfect fit. Cravat: Matching grey swirl cravat with a diamante in the centre, velcro fastening at the back, complimenting the suit perfectly. 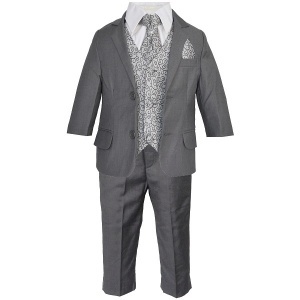 This grey swirl 6 piece slim fit outfit will make him look like the perfect handsome gentleman at a christening, wedding as a pageboy / guest or a special occasion. I'm very pleased with the 6 suits I've bought and the staff have been amazing thankyou for putting up with all my emails . Received 5 star service, delivered on time, even after I ordered the wrong colour waistcoat. Product of great quality too. Purchased 2 of these suits last month for our page boys (our twin son's). They are absolutely adorable and a great fit. Would of paid so much more in the wedding shop hence why we purchased from here. Best suit we have ever bought the boys. Thank you once again.